Pedestals placed "just so" or this pyramid will fall apart. Next time you are at a circus, watch what's going on during intermission. Or on the ground during an aerial act high above your head. What you'll see is a flurry of activity as the artists coming up next are checking and testing their equipment. Before the lion or tiger act, you'll not only see the big net or cage go up . . . you'll see the lion tamer walking through the whole set up. He or she will be adjusting the position of a stool here and there. Looking around for stray items. Making sure the door locks securely. If you know cats, you know that anything out of place can be a major distraction. Which can spell major disaster for both the animals and the trainers. Besides that, who wants to watch an act that isn't working? No fun for anybody, then. Likewise, teachers need to check out the learning environment every day. Like lions and tigers, students entering their classroom have an expectation that everything will be in its place and working properly. When it's not, that can be distracting. That probably won't trigger a deadly fight, as it might in a lion act, but it will definitely disrupt the learning process. Possibly in a dramatic way. Here's an example. I was teaching a class in a large medical school lecture hall. Every Monday, Wednesday, and Friday morning I went to the room a half hour early to check out "the arena." Mine was the first class of the day, so it was easy. But I also try to do that even when my class comes later in the day. I'd check the sound system, walk around making sure everything was reasonably clean and in good order. One day, I walked in to the room to find that the entire ceiling had fallen down! It was a "drop ceiling" and remodeling of the room above had loosened the ceiling anchors. I was able to quickly find another lecture to which I could move my class. I put up signs telling students where to go. I got my department administrator to make arrangement for a long-term room reassignment. We didn't miss a beat. The learning process was not interrupted in the dramatic way it would had I not happened to check out the room that morning. How many times have we had classroom technology not work correctly just at that "light bulb moment" when we needed it work and bring home a complex concept for our students? How many times have we found that our students were distracted all day by a flickering light tube? Had we checked out these things ahead of time, we wouldn't have those problems. Or at least we'd avoid spending "learning time" trying to secure help to get things fixed. Things would have gone a lot more smoothly in terms of teaching and learning. So just as I did when I was a lion tamer, I take an extra few moments every day to check out my spaces to do what I can to make sure that avoidable problems are taken care of before they harm my students' ability to benefit from the learning environment. 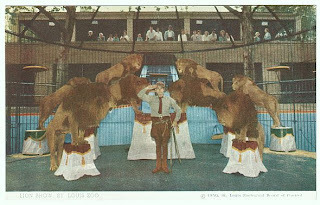 Lion Tamers Guide and Lion Tamers Guide to Teaching are trademarks of Lion Den Inc.